Soo Young got hooked on teaching through giving lessons in her private piano and voice studio on Kent Island. She was also the music teacher at Shine Like Stars Preschool and Chesapeake Montessori School. 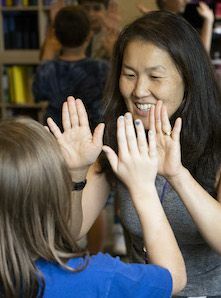 She is certified in Orff Schulwerk, in which children learn music through play—an approach she pairs with FCS’s emphasis on the whole child. Soo Young specializes in singing Baroque and early music, particularly the works of J.S. Bach. She enjoys spending time with her family and eating anything her husband cooks.